Craft the Sweet and Spicy necklace for Quick + Easy Beadwork with this must-have bead kit! Limited quantites available. Sweet and Spicy Bead Project Kit! 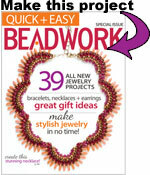 Get all the materials and instructions you need to stitch the cover project from the Quick + Easy Beadwork magazine. 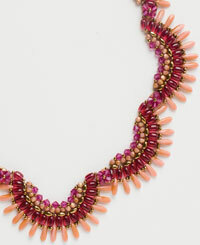 Boost your bead stitching skills, as you create this stylish necklace project! Perfect for beginners looking for stylish projects, or the veteran beader looking for a project to make in a flash, get ready to fall in love with this stylish necklace kit. Hurry, only 300 kits available! Don't wait; claim your collection today! The look is very different in reality. A whole lot of light was used when they photographed this necklace. It changes the appearance of the necklace.